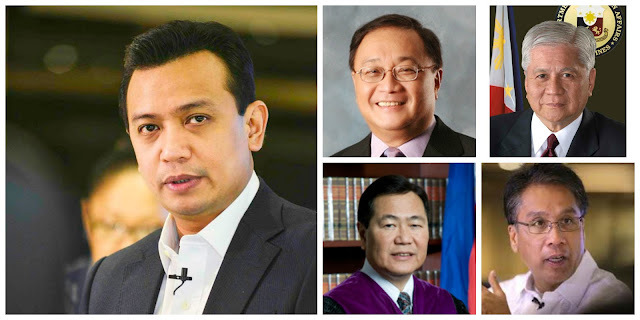 The blogsite Thinking Pinoy narrated how the Philippines allegedly flip-flopped on its stance on the West Philippine Sea dispute, and said that this was caused by former President Benigno Aquino III, Senator Antonio Trillanes IV, former Foreign Affairs Secretary Albert del Rosario, businessman Manny Pangilinan, Justice Antonio Carpio and former Senator Mar Roxas. Rj Nieto, the writer of the article said that all the talks with China that were initiated under the leadership of Aquino failed because the country did not want to compromise in the first place. He said that the US was also not willing to back us up. "Well, if the United States was really serious about helping us in a prospective war, it would have already issued stronger statements in as early as March 2011, but it did not. As a matter of fact, when the UNCLOS decision came out last week, the US used “quiet diplomacy” to persuade us to calm down.," Nieto said. He added that Secretary Del Rosario had an uncompromising stance, and that things wot worsened when then United States President Barack Obama said that the US will stay as a pacific power, and defied China when it warned it to not meddle with the dispute by saying that his administration will rebalance American attention towards Asia. This prompted China to send vessels in the shoal. "Just when we thought del Rosario can’t get any more hardline, he announced in January 2012 that the Philippines is prepared to validate its claim under the UNCLOS. He even taunted China by inviting it to do the same with its own claims," Nieto said. "In April 2012, a Philippine naval ship, two Chinese vessels and at least eight fishing boats got into a standoff in Scarborough Shoal. In response, China gradually increased its naval presence in the area. By late May 2012, ninety-two (92) Chinese ships have already occupied Panatag Shoal. Yes, NINETY TWO SHIPS. CHINESE SHIPS," he added. Nieto said that both navies agreed on a troop pullout at around 15 June 2012. The problem, however, is that China didn’t pull out its vessels at the same time the Philippines did, their troops stayed. Afterwards, the PH claimed intimidation, while China said that there merely was miscommunication. Nieto said that the problem was that the DFA issued press releases even before it asked China for explanations. He said that the DFA and Del Rosario failed. "The Aquino administration said it wants to try to engage in peaceful and fruitful negotiations with China, but it continues to provoke the Chinese government by sending conflicting messages," he said. "The failure of PH-China diplomacy in mid-2012 can be attributed to Foreign Secretary Albert del Rosario’s preference for an uncompromising stance over the issue, along with the fact that he talks too much. Del Rosario loved issuing press releases about everything that happens in the South China Sea, further antagonizing the Chinese. According to former Ambassador Sonia Brady’s notes as relayed by Sen. Juan Ponce Enrile “US has already let (del Rosario) go, binitawan na siya," he added. He said it got worse when the Aquino admin decided to go with informal or backdoor channels and that Manny Pangilinan was part of the aggravating factors. "Remember that this mess started with MVP’s Forum Energy – Philex joint venture, when its ship sailed to Reed (Recto) Bank, trying to to look for hydrocarbons. MVP seems to have changed his mind: he now wanted Chinese participation, something that Filipino major shareholders were not very happy about," he said. He noted how on 24 June 2012, Pangilinan announced he plans to “internationalize” and “depoliticize” Reed Bank by including China into the venture, through state-owned China National Offshore Oil Corporation and it was discovered that Pangilinan was del Rosario’s own backdoor negotiator. PNoy even asked del Rosario who authorized MVP to strike a deal with CNOOC. He also implied that former LP Senator Mar Roxas was also connected with Pangilinan and del Rosario, owning shares in Philex, which del Rosario is director of. He also said that Associate Justice Antonio Carpio, one of the most vocal personalities in the UNCLOS case, was also associated with Philex. "Carpio is affiliated with the Villaraza and Angangco law firm [TV5], more common known as “The Firm”. “The Firm” is heavily identified with the mining sector [TheFirm], with some of its members giving lectures sponsored by the Chamber of Mines [CoM]. More specifically, one of “The Firm’s” biggest clients is Philex Mining." "Manny Pangilinan, Albert del Rosario, Mar Roxas, and Antonio Carpio share one common interest: PHILEX," he said. He said that Pangilinan started negotiating with China in early 2012, that is, Philex is now willing to share profits with China, but changed his mind and went with Indonesia. He noted how Trillanes messed the negotiations with China, and it became personal between him and del Rosario. "The del Rosario-MVP camp didn’t want to share the South China Sea, then it tried to share it, but it refused bilateral talks. Meanwhile, PNoy-appointed Trillanes who wanted bilateral talks, but doesn’t wanna share the South China Sea," he said. "And in the middle of it all, siniraan pa ni Trillanes si del Rosario sa harap mismo ng mga Intsik! If I were China, I would say, “Putang ina, ano ba talaga? Ang gugulo niyo ah!”," he added. Nieto said that the Aquino administration bungled every diplomatic opportunity that came along the way, the Philippines had nothing else to do but to initiate UNCLOS arbitral proceedings on 22 January 2013. When his article was published in 2016, he said that the people are still "desperately trying to figure out how to fix the mess that these idiots created."